"NOBODY'S FOOL" BOOK TOUR / Dates and venues. * Mon. May 27 - Boston - Trident Books, 338 Newbury St.
---OR choose "Pay by check" by using the "non-Paypal" link you see on some pages of the site. TO PURCHASE ANY ZIPPY BOOK, please use the SECURE PAYPAL BUTTONS BELOW. DO NOT go to the "Zippy Books or Annuals" pages on this site to order--only to look at the books. NOTE: If you are outside the U.S., please do NOT use the links below (shipping needs adjusting). Just contact us and tell us what you'd like & we'll send a custom Paypal link. NEW: "PICTURES WITHIN PICTURES" in-depth podcast review of "Invisible Ink". Worth a listen. CANADIAN CUSTOMERS: International shipping rates have gone through the roof lately. IF YOU WANT TO BUY JUST ONE BOOK, email PINHEAD PRODUCTIONS and we'll send you a (cheaper) custom purchase link. Obama-Lama-Ding Dong Signed Print Move over George, it's Donald's turn! 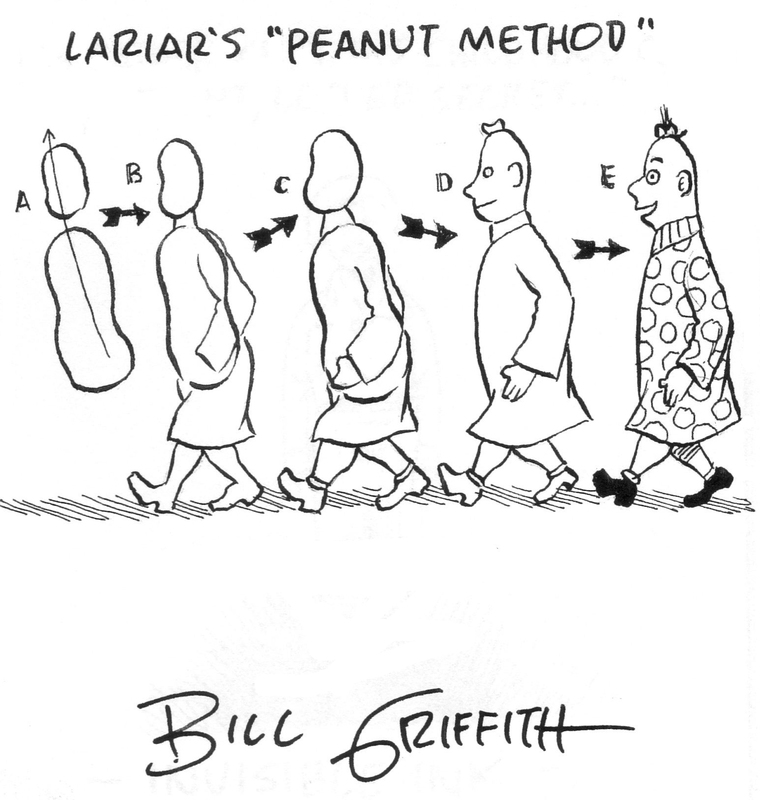 Get a FREE DRAWING by Bill Griffith in your book. Your choice of DRAWING A or DRAWING B, below. To ORDER, click on cover above and follow instructions on how to specify the drawing you want. NEW!! Mr. The Toad Sketch Original Art by Bill Griffith. Signed, only $25.00. "Don't Goad The Toad!!" ORIGINAL ZIPPY DRAWING--only $25.00-- Sketch is 4" by 6" and drawn to order by Bill Griffith! "Current.org" magazine piece on NPR's decision to stop mentioning some of the mellifluous names of its staff on air---Zippy is bereft! Want a FREE 44 page CATALOG of Bill Griffith Original Art, Signed Prints & more? CLICK HERE and type "FREE Catalog" in Subject line and message area. Free Catalog will be sent as PDF to your email. Video: Bill Griffith in conversation with writer Paul Di Filippo at MoCCA-Fest, April 2013. Check out this new interview with B.G. on the origins of his creative inspiration in Andrew Beckerman's excellent "Wrestling Team" podcast. 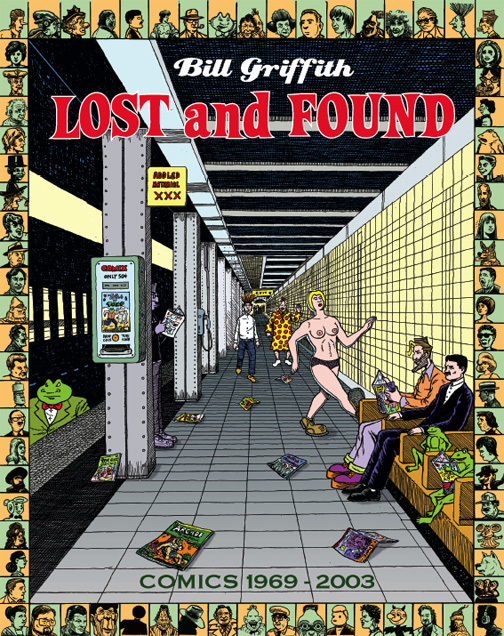 "Bill Griffith LOST and FOUND: Comics 1969-2003". BIG! 392 pages. Inscribed & Autographed! Collects hundreds of Griffith’s early underground comics, most of them long out of print and unavailable. 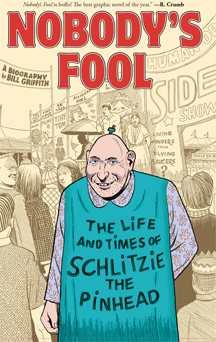 Includes Griffith's "mini-memoir" looking back on over 40 years of cartooning. (SEE ABOVE for huge SALE). REVIEW of "Lost & Found" from ATLANTIC Magazine by Steven Heller (with slide show). The ALFRED JARRY bio, "The Man With the Axe" by Nigey Lennon and profusely illustrated by Bill Griffith is now an e-book! Unearthed at last! ALL 9 "Videowest" Zippy episodes broadcast on San Francisco's KQED TV in 1980. That's Jim Turner (Of "Duck's Breath Mystery Theatre". etc.) as Zippy and Diane Noomin as DiDi Glitz. Low budget fun! Hour-long RADIO INTERVIEW with B.G. by Robin McConnell of "Inkstuds"
NEW: "Griffy" Sketch--only $25.00. A nice companion to the Zippy Sketch (see below). "Lost and Found" book review by novelist Paul Di Fillipo in Barnes and Noble Review/ The Speculator. "Lost and Found" book review by Alan Bisbort in "Literary Kicks". 180 pages of Noomin's best work from DiDi Glitz to "Red Diaper Baby". Big COLOR section. Order NOW for your inscribed & autographed copy. READ an appreciation of "The Family Circus" cartoonist Bil Keane (1922-2011) by B.G. in the Comics Journal. HEAR an entertaining interview with B.G. 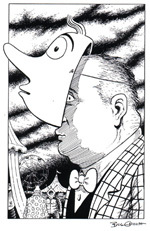 by Richard Roth - all about Griffy's career in comics - on NPR. Cartoonist PROfiles piece by R.C. Harvey on B.G. and Zippy's 25th anniversary in daily syndication, with lots of graphics at the end. See the Bill Griffith cover for jazzman Ken Peplowski's latest CD. Article in the Boston Globe by Jane Roy Brown on Zippy's forays into the diners & other mysteries of Massachusetts! 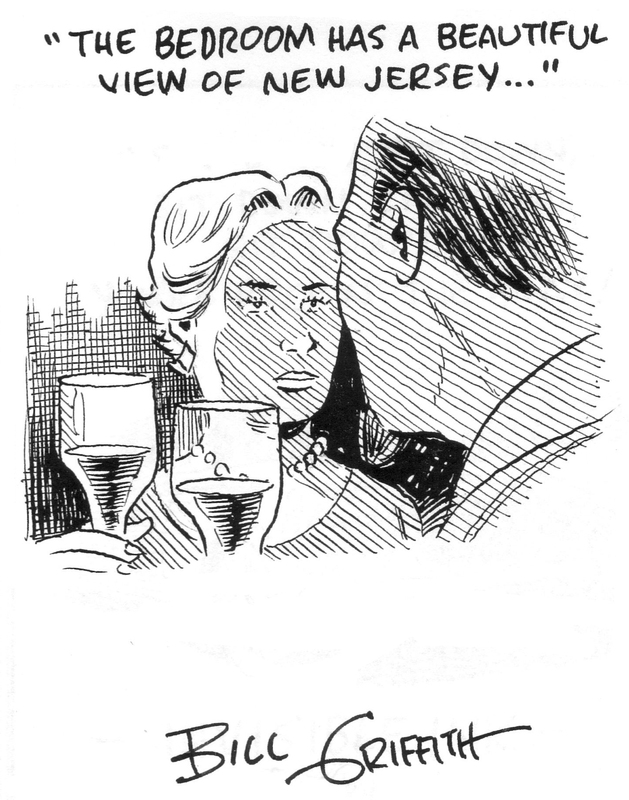 Highly recommended: Master Cartoonist Justin Green's blog---check back often! "The Condiments Song" from "Zippy the Pinhead: The Musical" (Private Sector/Baltimore, Nov. 2010). SEE Roadside Tipster Mike Dickau's photos (and the Zippy strips they inspired). Want to see photos of the "Real World" locations Zippy visits? READ "Griffy's Top 40: On Comics and their creation". READ a transcript (with many illos) of a talk by B.G. on the history of Underground Comics. HEAR a conversation between Bill Griffith & Colin McEnroe from 11/20/07. SEE a 1980 video of Zippy and Bill Griffith in the flesh. (Type in "Bill Griffith" in "Search This Blog" on new page. It's #14). 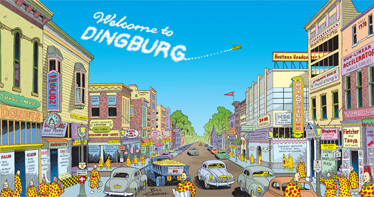 ZIPPY BOOK "WELCOME TO DINGBURG", with fold-out "main street" cover and aerial map of the "City inhabited entirely by Pinheads". READ an INTERVIEW with Zippy's creator on the Comic Book Resources website. OBAMA-LAMA-DING DONG image above also available as a Giclee Signed Print! 11" by 17" heavy paper, archival inks, signed by Bill Griffith. 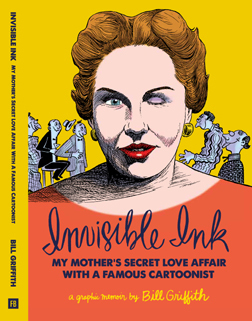 HEAR the in-studio BBC interview with Bill Griffith (& Garry Trudeau). Full Color Giclee Signed Prints of ZIPPY SUNDAY STRIPS! Large size, Ultrachrome Prints on 140 lb. acid-free Fabriano paper, using archival, lightfast inks. 30 little covers, one BIG Giclee print. Large Giclee Signed Print: "Zerbina Resplendent". Limited Edition. EXTENDED SALE! ALMOST ALL ZIPPY BOOKS 25% OFF!! More sale books under "Zippy Annuals", including latest Zippy book! PROMO for Zippy book: WELCOME TO DINGBURG. Bill Griffith interviewed in his studio on YouTube. 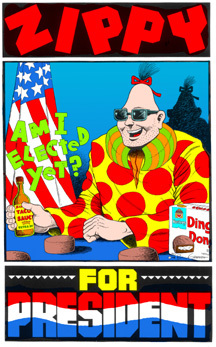 NEW: Zippy for President Signed Print. Full color, Heavy stock. "WELCOME TO DINGBURG" T-shirts! Also: Zippy Valentine's Day Cards, Birthday cards & NEW Mrs. Gowanus, Doggie, "Little Zippy" T-shirts, mugs & more. WHERE IS ZIPPY IN TODAY'S STRIP? Need more info--or other help ? CLICK HERE! NEW ZIPPY T-shirts! PLUS--LOTS of BRAND NEW Zippy swag available at zazzle.com! New Zippy tote bags, magnets, ties, bumper stickers, postcards, real U.S. Postage & more (click animated link at right!). 2 New Zippy Songs, ready to download!! LOTS OF NEW ART in both Zippy Original Art Galleries-- now available! Want to find out about Zippy's showbiz career? Or see a rare "ZIPPYSCOPE"? Or that Bill Griffith bibliography? Or B.G. 's New Yorker pages? Check out the "This Just In" archive. Want a daily dose of Zippy in your emailbox every day? Receive ONE NEW ZIPPY STRIP every day absolutely FREE! (IF you get a message after hitting "subscribe", just hit "continue") Subscribe now. The previous day's strip is usually available after 9AM Eastern time. LOTS OF ZIPPY and other Bill Griffith T-SHIRTS. Also posters, hats, postcards, real U.S.postage, buttons, key chains, tote bags, Zippy calendars and more! ZIPPY ORIGINAL ART - only $100.00! Commission an original Zippy drawing from Bill Griffith! 1000's of strips to peruse! Buy Signed Prints (of ANY Zippy strip) & Original Art: Dailies & Sundays. Pick a year .........in 2008? .........in 2007? .........in 2006? .........in 2005? .........in 2004? .........in 2003? ..........in 2002? ............in 2001? ............in 2000? Let Zippy take charge Again And Again And Again Yow! One More Time! Hear the Zippy Theme Song! Want a daily dose of Zippy in your emailbox every day? Receive ONE NEW ZIPPY STRIP every day absolutely FREE! NOTE: If you are an AOL customer & are NOT receiving your Daily Zippy, contact your server & tell them to allow mail from "subscribez@zippythepinhead.com".